There is NO observing tonight (7/1). There is NO observing tonight (12/12). There is NO observing tonight (11/12). We had a surprisingly low turn out for such a clear night. There were only 6 visitors and two scopes. But for those who came out they got to see quite a lot. With a 10″ Newtonian and a 6″ SCT we had good views of a motley collection of Messier objects, Jupiter and Uranus plus a few other DSO. Amongst our targets for the night were M31, M57, M81 and M82, M36 to M38, the double cluster, Alberio, and the planetary nebula, M78 and M79. Trevor tried for the Eskimo and could not get it in the murk. I had similar problems with M101 and M1. But these were made up for with nice views of M42 as it rose above the hedgerows. Hopefully this will tempt a few more of you out to our next observing session in December as a welcome break from present wrapping. We will be observing tonight (14/11) at Britwell Salome from 8pm. Error in the event times. It has just been pointed out to me that the calender page and next event widget are showing the wrong start time for our meetings. I don’t know why it has decided to do this and I will correct it as soon as possible. Please note that the correct start time for all our meetings is 8pm. Our last observing session, 16th October. It didn’t take long for some high cloud to come and hide the deep sky objects from our telescopes, but for the few members who made the journey we did manage to get to see some stuff. M57 and M31 were the only deep sky objects. We got a faint look at comet Hergenrothe and a nice view of Uranus. A bit later we had some nice views of Jupiter as it rose above the trees. It was nicely framed by the Galilean satellites which formed a rectangle surrounding the disk of the planet and on which several bands could be seen. One of our members even managed to get a picture of it on his phond through the scopes eyepiece! 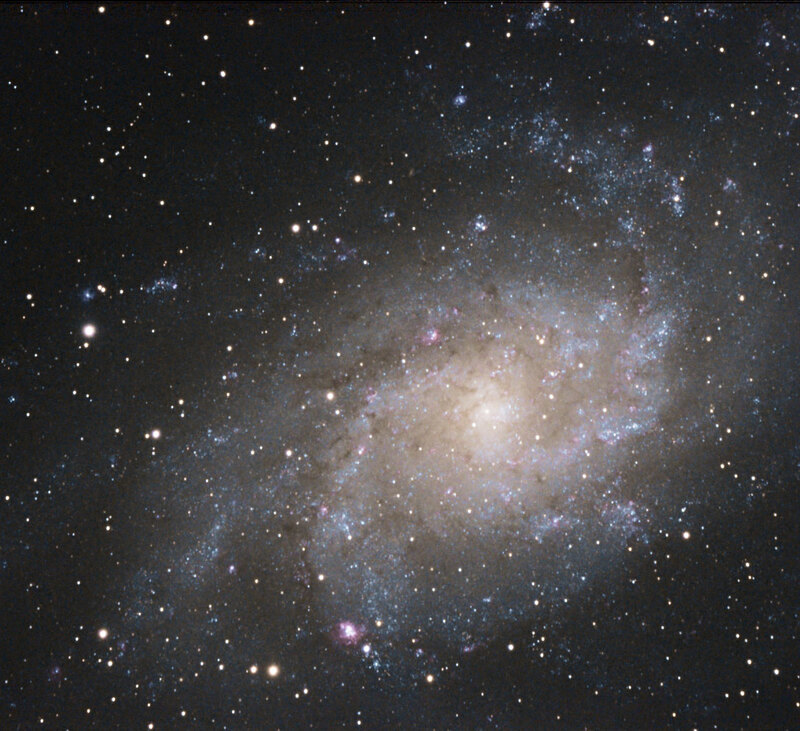 A nice image of M33 from Clifford’s remote setup.